Domestic cats can be infected with a variety of enteric protozoa. 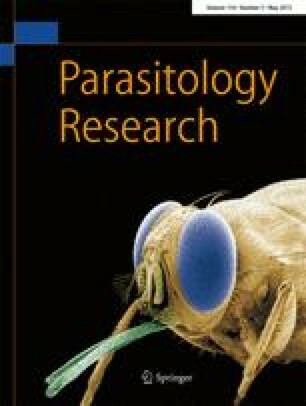 Genotyping of protozoan species, especially Giardia as the most common, can improve assessment of their relevance as zoonotic agents. For an overview on the occurrence of feline enteric protozoa, 298 faecal samples of cats from private households, catteries and animal shelters in Austria were collected. All samples were examined by flotation and using a rapid test for Giardia (FASTest®). For the detection of Tritrichomonas blagburni, freshly voided faeces (n = 40) were processed using a commercial culturing system (InPouch™ TF-Feline). Genotyping was done at the β-giardin gene loci (each sample) and triosephosphate isomerase gene loci (positive samples) for Giardia and at the 18S rRNA gene (positive samples) for Cryptosporidium. Thirty-seven samples (12.4 %) were positive for Giardia by flotation and/or using a rapid test. Cryptosporidium was present in 1.7 %, Cystoisospora in 4.0 %, Sarcocystis in 0.3 % and T. blagburni in 2.5 % of the samples. Genotyping revealed Giardia cati, the potentially zoonotic Giardia duodenalis and Cryptosporidium felis. Most of the infected cats had no diarrhoea. Cats from shelters were significantly more often infected than owned cats (p = 0.01). When comparing Giardia detection methods, the rapid test had a higher sensitivity than flotation. Polymerase chain reaction (PCR) results were mostly independent from the other two tests. The online version of this article (doi: 10.1007/s00436-015-4408-0) contains supplementary material, which is available to authorized users. All of the studies reported herein were performed in compliance with current applicable local laws and regulations.